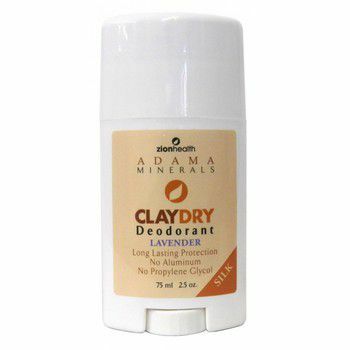 The Lavender version of our deodorant utilizes Lavender Oil which is highly antiseptic, helping combat bacteria and viruses, in addition to soothing any kind of skin irritation. Featured Ingredient - Lavender Oil contains the natural alcohol Linalol. Linalol provides antiseptic properties by effectively killing bacteria and viruses. Linalol also helps healing skin irritations including burns, wounds, acne and sores. Ingredients: Kanwa Clay, Calendula Extract, Alpine Lichen Extract, Chamomile Extract, Grapefruit seed extract, Purified Water, Propanediol, Aloe Barbadensis Leaf Juice, Sodium Stearate, Witch Hazel Distillate, Myrhh Gum Extract, Lavender Fragrance. (Natural Fragrance will slowly dissipate once bottle is open). Contains NO : Artificial Ingredients, Parabens, Propylene Glcyol. Zemea® propanediol is a skin-friendly, natural and petroleum-free glycol alternative for the cosmetics and personal care market. Approved by Ecocert™ and certified by the Natural Products Association (NPA), Zemea® is a 100% natural ingredient. Zemea® is the perfect glycol alternative for formulations where non-petroleum based ingredients are desired. Benefits include its high purity, lack of skin irritation or sensitization, improved humectancy, excellent aesthetics and environmentally sustainable nature. It is currently being used in many major hair and skin care brands around the world. Zemea® propanediol can be used to replace glycols such as propylene glycol (1,2-propanediol), butylene glycol (1,3-butanediol) or glycerin.